My sweetheart’s favorite Aunt just suffered a devastating blow. her mother and longtime dog companion died on the same day within five hours of each other. She is grieving so deeply. 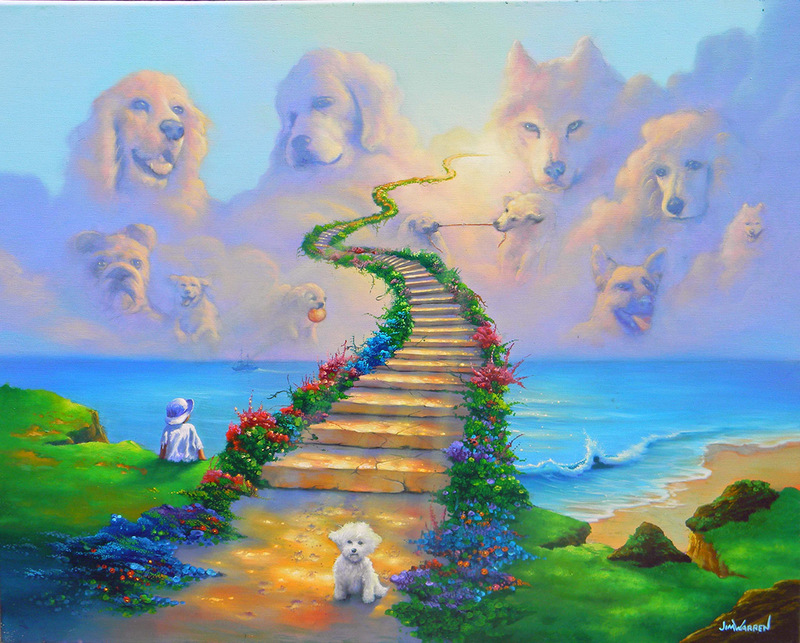 I love this painting All Dogs Go to Heaven but cannot tell if you sell it in poster form. I am on disability and my funds a re limited. My email address is smadison@earthlink.net. The beauty of your work is staggering and I have loved it for years. We recently bought one of your All Dogs Go to Heaven prints (17 out of 250) at Put-In-Bay, OH. We are currently waiting for shipment. We had a newfoundland “Misty” who passed away in 2008 and currently have another one who is still a puppy “Abby”. Thank you for creating beautiful work. I saw this on facebook. How much does this print cost? I just saw on face book all dogs gives to heaven . So moving and inspiration able . Hello! I love dogs & I love the print “All Dogs Go To Heaven”. How much would a print cost me? pls., & thank you! Where can I purchase a print of this? it is so beautiful. I would like more information on how to buy and price on this print. I am interested in a print.. My schnauzer just passed and this painting just touched my heart. I miss her so much. I think we all want to believe, and we probably are right that our pets are still there in spirit, playing and doing the things we loved about them in the first place.